Thank you. Simply thank you. The love that has poured into my inbox and over my phone line is invaluable to me. I will be answering each and every email. Mondays and Tuesdays are notoriously crazy around here, and today was no exception. Just know that you all have touched my heart, and I love you for it. 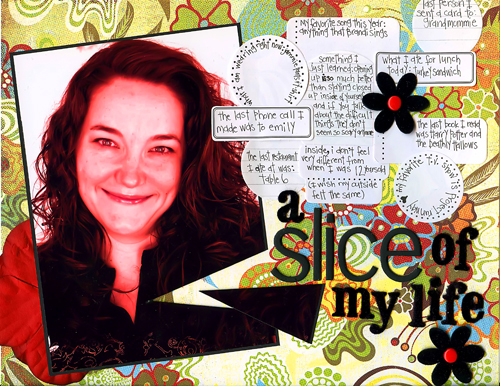 I did find time to do a page for our next journaling challenge that is going up in the morning. Great layout, you are one talented girl! Hope your Tuesday isn’t too crazy. Ooooohhh…me likey the LO. Nice use of an under-loved piece of BG! I guess I have tp go to the JJ blog to read the journaling, eh? super page – I was surprised that I already knew a lot of those things about you 🙂 I think you need a webcam so you can make a hundred goofy faces. and of course the pink converse.